The movement of crops around the world by people has been responsible for much ecological chaos. 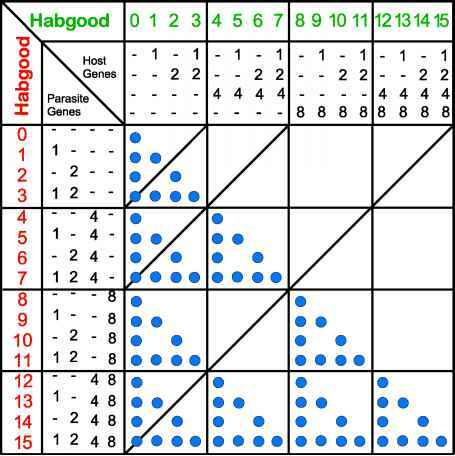 It has also led to a special categorisation of crop parasites (Buddenhagen, 1977). Old encounter parasites are those in which the host and parasite have evolved together and remained together. They may also have been moved together to a new area. New encounter parasites are those in which the host and parasite evolved separately, in different parts of the world, and were brought together by people. Typically, the parasite is moved to a new area where it able to parasitise a botanical relative of its original host. Both Phylloxera (Daktulosphaira vitifoliae) and downy mildew (Plasmopora viticola) of grapes are typical examples of grape parasites that originated in the New World and were moved to the Old World. Alternatively, the host may be moved to a new area where it encounters a parasite of a wild botanical relative. Colorado beetle (Leptinotarsa decemlineata), of potatoes in the United States is a typical example. A third possibility is that both the host and the parasite are moved to a new area where they encounter each other for the first time. This happened, for example, with potato blight (Phytophthora infestans) in the northern hemisphere. Re-encounter parasites are those in which the host is moved to a new area and the parasite is left behind. Freedom from the parasite may lead to a commercial advantage, and the crop then becomes important in its new area. For example, most of the world's coffee is grown in the New World, although coffee originated in Africa. Similarly, rubber originated in the Amazon Valley, but most of its cultivation is in Southeast Asia. Such crops may also lose resistance in the course of their propagation and breeding in the new area. When the parasite eventually reaches this new area, it is a re-encounter parasite, and it is likely to be severely damaging because of the loss of resistance in the host. Puccinia polysora was a typical re-encounter parasite of maize in tropical Africa (see 7.2).